Construction begins on an innovation centre at Red River College, Winnipeg. 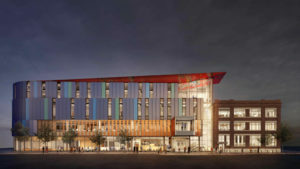 The 9290-m2 (100,000-sf) development designed by Diamond Schmitt Architects in joint venture with Number TEN Architectural Group incorporates a repurposed downtown heritage building and new construction to create a dynamic crossroads with state-of-the-art facilities for applied research, entrepreneurship, and commercialization. 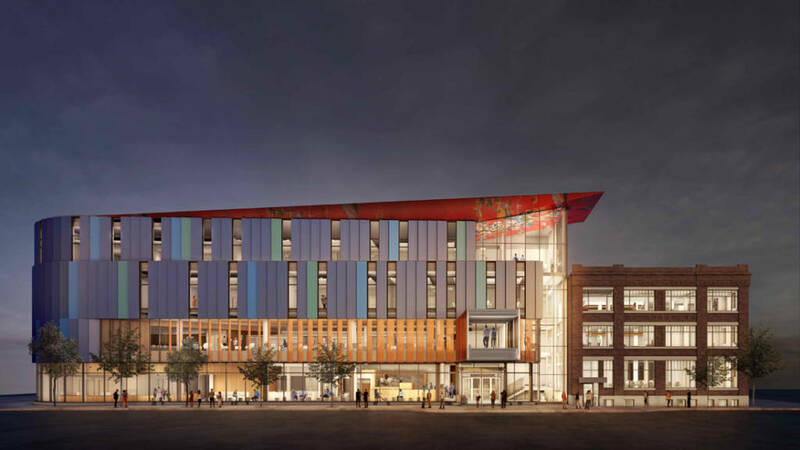 A hallmark of the centre will be the collaboration with industry and the emerging startup sector of Winnipeg’s Innovation Alley. The building’s design features distinct and thematic zones that underscore this engagement. Innovation zones are transparent program areas emphasizing the everyday experience of students, faculty, and staff. The threshold between the new and existing structures is bathed in natural light to reveal the subtle excellence of the century-old Scott Fruit Building. The Roundhouse anchors the west corner of the new building and is the symbolic centre, imbued with Indigenous meaning and European history. At roof level, the City Room will be enveloped in bold traditional art steeped in local culture. The art will be visible both on the ceiling of this fully glazed space and across the cladding and soffit. Targeting net-zero energy consumption, the skin of the new high-performance building consists of photovoltaic (PV) glass panels that create energy and also change colour depending on the angle of view and weather conditions.